Watching the bride and groom cut the wedding cake is as much a part of the wedding day highlights as hearing them say 'I do'. Possibly even more so, as there's a piece of cake to be had at the end of it! The bride and groom cut the cake together to symbolise their first shared duty as a married couple. It also makes a great photo opportunity for the assembled well-wishers. 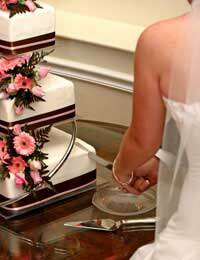 The association shared between cakes and weddings goes back to Roman times at least. Although the wedding cake was a rather basic mix of salt, water and wheat flour, it was shared amongst guests during the actual wedding ceremony rather than the reception afterwards. In the UK however, earlier cakes were similar to the traditional shape that we still see today - a flat, round cake baked with fruits and nuts - said to be a symbol of fertility. Sometimes a ring was placed inside the wedding cake, and the person who found it was said to be guaranteed happiness for the coming year. Over the years many customs have come and gone - including crumbling cake over the brides head, or throwing small cakes at her in a way similar to confetti throwing - which most modern-day brides will be glad they didn't have to endure! What are wedding cakes made of? Often, a wedding cake will be made up of three tiers of iced fruit cake, which is thought to be inspired by the impressive spire of London's St Bride's Church. With this type of cake a popular tradition still exists - that is saving the top tier for either the couple's first wedding anniversary, or the christening of their first child. The tier is usually frozen until such a time when it is needed, but if you are planning to do this, check that the cake is suitable with your caterer before you do go ahead. However, in recent years, cakes have changed shape, size and style so much that almost anything goes and couples are free to choose a wedding cake that fits their wedding perfectly. Available in all shapes and sizes, cakes are now as varied as a basic sponge or a tower of profiteroles or mini doughnuts, where guests will be served with a single profiterole or doughnut rather than a more traditional slice of cake. Technically, there's not very much difference between a 'wedding' cake and any other cake. Except that one will be photographed a lot and will probably cost a lot more than a Victoria Sponge. Nowadays any cake can be used as wedding cake; it's entirely down to the personal choice of the bride and groom. There are sponge cakes, chocolate cakes, cheese cakes, fruit cakes, round cakes, square cakes, tiered cakes, flat cakes, simple cakes, incredibly complicated and impressive cakes so budget allowing - anything is possible. What's the protocol for cutting the cake? When the cake is brought out, it should be placed on a beautifully decorated table which stands in front of the top table where the bride, groom and all the major attendees sit. If it's a big cake, you will want to make sure that it is situated somewhere that allows the rest of the guests to see the head table. The cake cutting should be announced before it takes place to allow everyone time to get ready. Usually the cutting will take place after the speeches have been made but depending on what the bride and groom choose to do, it can actually take place later on, when the evening guests have arrived so that they don't miss out. When they make the first cut, the groom should place his hand over the right hand of the bride, and they will together cut the cake. The groom then feeds the bride with the first slice and then she returns the favour. The cake will then be taken away to be cut behind closed doors, and the cake will then be either served, or wrapped up to be taken home by the guests. How do I know which cake is right? When choosing your cake, most people will want their guests to remember the cake for fitting in with the day perfectly, rather than because it stood out like a sore thumb. So make sure that you're happy with the cake you've chosen, because if you're not it will come back to haunt you every time you see the photographs!